I started the pact in November 2015, and shall soon have to stop thinking in terms of numbers as I am already more than halfway through. 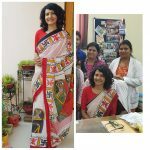 I was sitting on the idea of wearing sarees to clinic since quite some time, and the pact gave me the necessary push. First submission on here… my mum-in-law”s firm favourite, a monochrome crepe saree that I paired with a cropped alpaca sweater and a belt. Maybe a year or two back, I wouldn’t have dared to copy a runway trend to clinic (shudder! ), but I’m amazed how practical the belt turned out to be! It instantly transformed the drape into something worthy not just of a full work day, but some running around behind the toddler too!